My tooth is killing me, They don't understand I need antibiotics, I don't heal well at all, and they don't give out antibiotics with teeth work anymore due to studies shown it is not effective and could cause your body to not be able to use antibiotics when you really need them...trust me I NEED THEM!!!! ugh!!! Other then that...fridays bead show was fast and fun, we were in and out and I did not spend much! The BBQ island gets delivered tuesday so be on the lookout for pictures!! I made an awesome ring in class today, it has to get fired in the kiln but wait until you see this...Spectacular!!!! It was a busy and expensive week! I had to go to the dentist, a bbq warehouse, and a bead/gem show and it ain't over yet, I still have a root canal and another bead show to go!! Today is a redo on a root canal at 1:00 and then Friday all the beaders will be at Palace station for the bead show. The bbq warehouse was a fun little stop on tuesday...there was an island that had just what we needed on it going for 5400.00, got charlie in there and we got it out the door for 4500.00 flat! Pictures will be taken when it arrives in about 10 days. It has a round bar table with an umbrella hole, a fridge, and a 28" z grill, a little light and paper towel holder. It does not have counter space on both sides of the grill like I wanted but, we are spending 2000.00 less so I guess you have to compromise somewhere! So check back soon more fun from Viva Las Vegas! To all the ones who are serving or who have served in the military, thank you, thank you thank you for my freedom, I truly appreciate everyday I live in this free country!! I made this for my son, it has a guitar pick and a harmonica....I hope he likes it! (I put it on a manly chain)! Well, I took Charlie to his favorite mexican restaurant for his birthday enchiladas, then he wanted to play bingo...where he won 250.00 in the 2nd chance coverall! He is sooo lucky at that game! I don't win but I enjoy the game. So here's a little George for ya...enjoy! I have shared 2o birthdays with you...I hope to share 20 more! 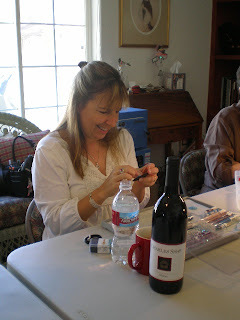 Me in bead class, yeah, the three food groups, water, coffee, wine!! My new peace sign, the view from my kitchen window! Up close, outside! Got it at artfest in henderson! Charlie came down with the flu April 29th, he is finally over it with just a little cough left, as soon as he came home with it, I avoided him, I slept in the guest room, I washed my hands and the house constantly, I made him cover his mouth and I covered mine when around him, I did this for the first 5 days which may have saved me, I also started taking zicam melt in your mouths tablets 3 times a day, I am still taking them! My friend Colleen had the flu last month and suggested the zicam, it's good stuff! We are praying I do not catch this, I do not do well when I get sick and usually end up in the ER with severe dehydration (I always get 3 bags of fluid when there), even though I try to drink as much as possible. I thought I would post some information about the flu, it is amazing how many people really don't know much about the flu and think it is stomach problems (those are usually from eating something with bad bacteria in it). Please cover your mouth when coughing in public, it is our only defense, and cough into the crook of your arm, not your hands, it takes a while to retrain yourself but it is worth it. And wash your hands constantly! The flu is caused by the influenza virus. There are many different strains of the virus and they mutate frequently. That is why people continue to come down with the flu year after year. Influenza is spread by droplets from the mouth and nose. If a person with the flu sneezes or coughs, the virus is then released into the air, and whatever the person touches, and can then be passed on to others. The flu can be spread from 1 day before symptoms appear to 5 days after becoming sick. It is possible to spread the flu before you even know you have it. What to Expect From the Flu Virus: The flu generally lasts anywhere from 2-7 days, with 4-5 days being the most common. ( Charlie is going on 10 days now!) People with the flu usually run a fever, have aches and pains throughout their bodies, feel exhausted, experience severe headaches and may have cold symptoms. These symptoms come on more rapidly than they do with a cold. People with the flu are typically unable to perform daily activities due to the illness. Is There a Cure for the Flu? : There is no cure for the flu. There are some prescription antiviral medications, such as Tamiflu(TM), that may help shorten the duration of the illness. However, Tamiflu(TM) is only effective if taken within the first two days of the onset of symptoms. Your doctor will determine if these medications are right for you. We got away to phoenix this past weekend, wow, that was nice!! We flew into phoenix friday at 2:00 took the shuttle to the windham hotel, very nice place, dropped our bags and met up with deb and leonard then we walked to the ballpark, just a couple blocks, got to chase stadium at 5:00 ate and watched the game, they had fireworks afterwards, it was a real nice day, so warm and I did not need a jacket!! Walked back to the hotel and crashed, charlie fighting the respitory flu the whole time, poor guy was such a trooper!! Saturday found us meeting up for breakfast (nice) then me and debbie walked right down the block to the convention center, did I mention how great the hotel was!! No rental car needed at all!! Got to the hotel and met up with Mandy, shopped from 10-12:30 then went to our classes, me and mandy made a heart wire and bead wrapped pin, I will post a photo once I am done....Deb had a polymer clay bead clas that was very good too! Once class was over we met up in a local pub to watch the nascar race, ate tons of appitizers and beer and wine, all in all a great time, woke up and ate breakfast at the hotel coffee shop again, nice, then we went our seperate ways. Thank you Debbie and Leonard for a fun time!! The Stadium opened the roof just for us! That was remarkable!! I love that the police ride around on horses, how cool is that!! This one was beautiful! !